While visiting Amsterdam recently, I asked a friend if he had heard the weather report for that afternoon. He responded by calling up a ‘real-time’ satellite weather tracking website on his laptop, which showed us in convincing graphics that it would rain at 1:00 pm that afternoon. Sure enough, while walking down the Damrak later that day I felt a rain drop and checked my watch: exactly 1:00 pm. My friend’s online forecaster is not simply a predictor of future bad weather patterns, but also a mode of proleptic preparation for always already imminent future shocks, surprises, or disappointments. (I emphasize bad weather for a reason: the stakes are very different when the forecast is for sunny weather…). Like weather forecasting, the nature of mediation – and mediality – has evolved since the 1990s, the most significant change coming in its temporal relation to its subject matter. Now it is no longer the past or present but the future that is not simply mediated or remediated but premediated. Richard Grusin’s new book elaborates this concept, expanded from a journal article of the same title. According to Grusin, premediation, unlike run-of-the-mill prediction, gambles on being wrong: it mediates possible negative future scenarios in order to “protect us from the kind of negative surprises that might await us in an unmediated world” (127). In other words, premediation keeps us in a kind of purgatorial present indexed to an apocalyptic future that we hope never arrives, a state of perpetual anticipation whose function is cathartic insofar as its predictive potential always fails. This is as close as we get in this hyper-mediated life to paradise. But first, what does Grusin mean by the two terms, mediation (or mediality) and remediation, which are the necessary preconditions for premediation – and yet whose functions today, according to Grusin, are always already subsumed by the new term? “By mediality I mean generally to call attention to what media do, to the ways in which they function as agents within the heterogeneous assemblage of twenty-first-century American and global society” (72-73). Furthermore, “people and things function actively together to create or invent new forms of mediation” (76-77). In other words, mediality in Grusin’s usage is an updated version of Stuart Hall’s “productive consumption” model of individual engagement with popular culture, going beyond the production of consumption or manufacturing of desire symptomatic of more classically modernist models, exemplified by Adorno and Horkheimer’s culture industry essay. Grusin opposes mediality to representationality, whose regime it supplants. And, where representationality “concerned itself chiefly with a referential fidelity to its object,” mediality concerns itself with “modulating affect” (79). For Grusin, mediality and affect replace ideology and psychoanalysis, respectively, both of which involve the interpretation of signs, images or symptoms. But, while it is interesting to note that “the mass media are not mediating anymore – they become direct mechanisms of control by their ability to modulate the affective dimension” (80), there is also the great danger here of forgetting what remains useful in the Althusserian definition of ideology as the representation of our imaginary relations to the real conditions of our existence – i.e. there is no ideology without image – hence the danger of overlooking the formal, pre-affective, mediating dimension of the image. Grusin distinguishes between mere emotions, which after all qualify as signs–being visible, readable, and interpretable–and affect proper, which in this view is some sort of pre-signifying quantity or quality: “an unqualified bodily response independent of, and perhaps phenomenally prior to, our understanding of the emotions they evoke or the meanings they entail” (81). If we accept this definition, it is difficult to not question how can such a thing as affect be theorized? Without images, mediation, form, content, and structure, etc., there is no meaning and therefore nothing to discuss; again, no ideology without image. In this view affect exists in some kind of pre- or extra-ideological zone, and yet Grusin insists on giving it precedence in his subtitle: “Affect and mediality after 9/11”. Ironically perhaps, the meaning of remediation is much clearer, deriving as it does from Grusin and J. David Bolter’s ground-breaking (and more clearly argued) book Remediation: Understanding New Media. The definition of remediation is initially two-part: mediation is everywhere, and always works hard to render itself invisible. Remediation is to new media what adaptation was to the old paradigm epitomized by intertextually determined literary or cinematic narrative. Under this new dispensation, new media forms do not simply repeat or reproduce older ones; they “claim to entail improvements of older media forms, or remedies of past defects” (145; my emphasis). This is the “reformative aspect of remediation” as remedy for the ills brought on by mediation gone wrong (145; my emphasis). In this meaningful pun, remediation is to hindsight what premediation is to foresight, the latter revealed as a kind of post-9/11 Promethean mediatory anticipation, forestalling future disasters not by “getting the future right” ahead of time but “by making futurity present” (146). At 179 pages Premediation is not long, but it appears to have been hastily written and edited, as sentences such as the following attest: “For individual and collective media users the maximization of positive affect by striving to mediatize the entire world helps to prevent a recurrence of shocks like those produced by 9/11 by producing a feeling of anywhere, anytime connectivity” (127). Such stylistic faux pas work unconsciously to underscore the central themes of a media-saturated post-9/11 world determined by the logic of what Derrida famously called toujour déjà: the future anterior tense in which most of us supposedly eke out our wirelessly connected, socially mediated, hyper-securitized lives. This is a view of the contemporary world in which the twenty-first-century mass media at once produce and mitigate the ‘shock of the new’ endemic to twentieth-century artistic modernism, and still a central pop cultural myth. Although by this name it is a firmly post-9/11 phenomenon under consideration in Grusin’s book, it is both ironic and appropriate that its theory of premediation should be reminiscent of other, older ideas about how culture continually produces versions of reality that variously prepare us for, protect us from, or conceal outright the social reality just ahead in what we fondly call the future. I do not intend it as a criticism to say that there is something ‘unoriginal’ about premediation, despite Grusin’s repeated claims to the contrary; in part, he is justified in arguing for its twenty-first century currency, tied as the concept is to contemporary technologies of cultural mediation, most prominently the internet and other manifestations of the new media that now pervade everyone’s life to some degree. To put it another way: to accuse premediation of being ‘unoriginal’ is to miss the point that its ‘unoriginality’ is precisely the point. For, according to Grusin, in the post-9/11 period, the U.S. strove to ensure “that the American public never again experienced live a large-scale catastrophic event that had not already been premediated” (12; my emphasis). In other words, premediation means that an actual catastrophe like 9/11 is replaced in the media by a ‘real-time’ simulacrum of itself – the intention being that, should the American public of necessity undergo another such catastrophe, at least it will not be one, like 9/11, that was mediated, and continues to be remediated, but was so woefully un-premediated. But is this really true? And what exactly is premediation? Grusin’s answers waver between the repetitive and the contradictory, a situation stemming from his perhaps understandable desire to distance himself from his antecedents in this theoretical field, especially Jean Baudrillard and Slavoj Žižek (13). 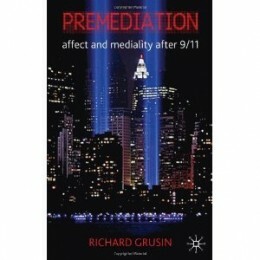 Grusin acknowledges that both thinkers point out that the events of 9/11 did constitute an instance of proto-premediation in that the now iconic images of planes crashing into skyscrapers and buildings collapsing had been seen before in Hollywood films, especially for some reason in pre-millennial late-90s films, like Independence Day (1996) and Fight Club (1999) (14). On this point Grusin neglects to mention Susan Sontag, who was one of the first to observe the contradictory, even chiastic, nature of eye-witness accounts; to wit: it can’t be real, it looks just like a Hollywood movie; it looks just like a Hollywood movie, therefore it must be real. Nor does Grusin clarify the degree to which Žižek gets all of his best ideas on 9/11 straight from Baudrillard (via the Wachowski Brothers): welcome to the desert of the real, anyone? Premediation therefore means: before it is ‘real’ the future appears as a simulacrum of itself; how this is not equivalent to Baudrillard is not clear to me. It remains unclear as well just how the theory of premediation differs so significantly from, say, Baudrillard’s ‘precession of simulacra’ (45), as Grusin repeatedly claims. But perhaps he protests too much; it may be that his protestations fail to hide the fact that these ideas fall under the same paradigm, and that premediation is a useful concept insofar it extends rather than differs from previous theories of that thing formerly known as ‘postmodernity’. The emergence of what Grusin calls ‘premediated time’ (33) is really another name for the perpetual present of consumption, no matter how much Grusin talks about the necessity of remediating the future after 9/11. For, if the future signifies at all for the average person in the present it is on an affective level, and not as a distinct temporality as it were visible from the present, as in certain Sci-Fi scenarios. And, after all, such filmic and televisual visions of possible futures are on a conceptual level ultimately extensions of the present, while ontologically, like all photographically based images, they are uncanny emanations of the past. All this talk of the future or futures is highly misleading, as, once the future arrives, it is always already present. In this sense Grusin’s critique of Baudrillard becomes a distraction, as the question of the ‘real’ vs. simulacra becomes moot when the object is the future as such (and not just its representations): the future as such has no empirical existence; therefore it is not ‘real’ except as something that can be imagined, predicted, or feared – i.e. as image or representation whose reference is always ultimately the past. If anything, premediation is entirely dependent upon Baudrillard, as an extension of the concept of simulacrum as a term beyond the binary of real vs. unreal, model vs. copy, or referent vs. image. Grusin seems to forget that the ultimate thrust of Baudrillard’s theory is not the disappearance of the real as something to be nostalgically mourned, but as something forever rewritten in our new relationship to events via their representation in the media; their ‘mediatization’. But my final point here is this: rather than the pre-emptive anticipation of possible futures, Grusin’s book is really all about memory, insofar as premediation describes a process whereby the subject, confronted by the future, recognizes it as something always already seen and therefore, in a certain sense, known. The future is thus stripped of its unknowability, its otherness, reduced to a version of the same, the present, which is all we ever really have anyway. What premediation represents, then, is the further erosion and impoverishment of the imagination as an organ of creativity, balanced by the final consolidation of memory as prosthetic technology whose form, content and function are entirely determined by forces outside of and often wholly at odds with the best interests of the individual subject. That said, in reading Premediation one gets the sense quite strongly that it is one of those concepts which, to paraphrase Voltaire, if it did not already exist, would be necessary to invent. Bolter, J. David, and Richard Grusin. Remediation: Understanding New Media. Cambridge, MA MIT Press, 2000. Print. An Associate Professor in Wilfrid Laurier University’s Department of English and Film Studies, Russell Kilbourn specializes in film theory with a particular focus on memory. Dr. Kilbourn has published in the areas of film, cultural studies, and comparative literature, as well as on the German author W.G. Sebald, and has recently brought out Cinema, Memory, Modernity: The Representation of Memory from the Art Film to Transnational Cinema (Routledge 2010). He is also a series editor for the Film and Media Studies series at Wilfrid Laurier University Press.